The used filament is is driven by a stepper motor and fed through a rather stiff but flexible “Teflon” tube, called a Bowden tube, to the extruder section where the filament is melted and then dispensed as a very thin melted string. It is a clever idea since it reduces the mass at the moving “head” and allows faster acceleration. It also comes with drawbacks: The mounting method at both ends are not good and many users report problems because of that. Drive End: Since I have access to a machine shop I made a new mounting block for the drive end of the Bowden tube. I machined it out of aluminum and added mounting holes in the plywood drive frame to securely lock it in place. To anchor the tube I threaded it with 1/4″-28 which is a perfect fit for the 1/4″ Bowden tube. Since I live in the USA the tap and die were easily available. The mounting is now rock solid. I need to get shorter screws! 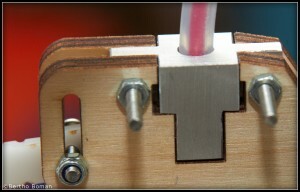 Extruder End: A similar problem exists at the extruder “hot end” mounted in the moving head section. The problem is more severe here since any movement allows molten plastic to leak out between the brass heater barrel and the Bowden tube which usually causes jams and failures in the printing. The connection here is a little trickier: The brass barrel has a 6mm thread and the Bowden tube is 6.35mm. There is a small threaded high temperature plastic that is originally half threaded by 6mm and a clearance cut for the 6.35mm Bowden tube and they are forced together by a clamping system that too often fails. 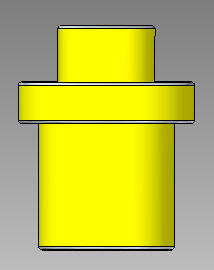 There are several options to improve the joint but none is ideal since metric and inch parts are mixed. Option #1: A half threaded adapter, 6mm on one end and 1/4″-28 on the other end would be proper but difficult to do for metric countries (I hope USA speeds up the switch). It is also difficult to properly tap the two different threads, one from each end. 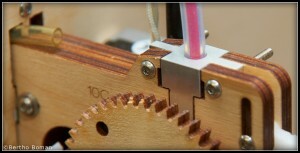 Option # 2: Another option that is all metric is to use 7mm thread on the Bowden tube. The tube is too small for a correct thread but it still works well. Again, not an easy part to make with two different threads butting up against each other. Option # 3: I settled on the third solution seen above. A straight through 6mm thread in the Peek adapter, which is extremely easy to do, and then I threaded the 6.35mm Bowden tube for a matching 6mm thread which is not too difficult. 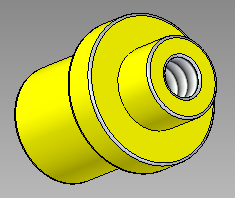 I placed a 3.2mm rod inside the tube to keep its shape and to keep it straight. After slightly tapering the tube with a sharp knife i got the threading die started properly and I just threaded a little longer section than needed and afterwards cut off the starting section. I extended the plastic on the top by 6mm compared to the factory version and that section is 10mm in diameter, so I had to slightly enlarge the previously tapered hole in the plywood to be just a straight through hole. It is probably not necessary to do the extension but it was easy and I got a much longer thread in the Bowden tube. 1: Easy threading 7mm on the Bowden but difficult to properly tap 7mm correctly meeting a 6mm thread. A sharp bottom 7mm tap is needed not to mess up the 6mm threads. 2: More difficult threading the Bowden with 6mm but very easy to thread 6mm straight through the peek. True, the extra extension can be left off in both cases. I also cheated, I did not add any flats or hex.